My car went in for it's 20,000 klm service today. But they were quite happy to wait until the service was due. For around the last 4 -6 weeks there had been a slight whistle coming from the turbo under boost. Which sounded more like a boost leak. It didn't affect the car either in performance or fuel economy. But last week a work mate mentioned that when I was leaving work in the morning. Smoke (blue) was coming out of the exhaust. SO I went home & slept. When I woke up around 1:30pm. I got my phone & recorded the car from a cold start up. Well coldish. It was around 35 degrees that day. That afternoon I rang Hyundai. Told them what was happening. As the car was booked in for it's service. They were quite happy to wait till then to have a look. I went to pick the car up this afternoon. Then I was told that the Turbo will need replacing. Which has gone to Hyundai Australia for approval. Then onto parts ordering. Which was also told there may not be parts in Australia & may need to come from South Korea. I haven't been told exactly what is wrong with the turbo. As I guess they may not be 100% sure themselves?? Maybe?? I am still able to drive the car in the meantime. But told not to drive it hard .. So, now just to wait for the follow up phone call for the work to be done.. Sorry to hear that you have this drama. But mate, well documented here ( wish some others could write so succinctly ) and you approached the dealer with evidence that could not be ignored. Hope its dealt with quickly. Cheers. Would think that there is a known suspect batch, or your guys are really on the ball. If smoke becomes worse, video and go straight back. As told , " drivable but be gentle with it" , is that in WRITING? If not get it. Can say the only time I was ever questioned on a warranty claim was when the radiator went on the Wife's FD. Sometimes stupid questions need to asked to follow a required procedure. Been on both sides of the questions. Yeah I've got no complaints from the Hyundai dealership at all. It's where I brought the car from & of course it was their demo vehicle. Yep have it all in writing. Got that with the service report. As it was also in for service. I wouldn't say that the car has been driven hard at all.. There are not many places on public roads to do that. Just mainly full throttle in 2nd & 3rd. By then your up to freeway speeds anyway. And most of my driving is on the freeway. So sitting at 2500rpm ish..
Fuel economy has been great the last few months as well. So whatever is wrong with the Turbo is no affecting that. 5.7lt / 100ks. It was on 5.6 before I had to slowdown for parking..
Jeepers Pete, that's crazy. Hope it gets sorted without drama. Try and get something fancy as a loaner. Yeah these things happen.. Not use getting peeved about it.. Only if Hyundai take their time about it. But so far it's been good with the dealership.. There is a Turbo in Australia. Coming from the Eastern States. Should be here this week..
Come in spinner! Don't know what that's got to do with it.. but I just felt like saying that! Got the phone call from Mandurah Hyundai yesterday.. Parts have come in.. So it's all booked for next Friday 8am. They mentioned that it's going to be at least 6 hours to finish. So I have got a loner car as well.. Be interesting to see what it is..
Also, as it's pretty much the only car I can take to work. I have done 1000k's since it was diagnosed. While fuel consumption has been really good (5.7 lt/100ks) The engine is not as smooth through the rev range as it was. Also the idle has been a bit rougher than usual. While there has not been as much smoke as before. It does seem to be happening more regular that it was.. Iv'e only got 2 shifts to do till Friday. So it won't get driven as much until then.. I assume you'll have to be a bit gentle on it for the first 1000 or so Kms afterwards? Be interesting to hear how she feel after the replacement. Pity you can't slip them a few hundred bucks and get a bigger turbo. Yep have been fairly gentle driving along.. Also forgot to mention that the whistle from the turbo is louder. Not by a massive amount.. But can hear it more.. Bigger turbo?? I know the older Veloster had a slightly bigger turbo. but will more likely be an i20 or something.. Actually, I wouldn't mind a base i30. Just to se what the driving differences are. The Base i30 6 speed is still a nice thing. 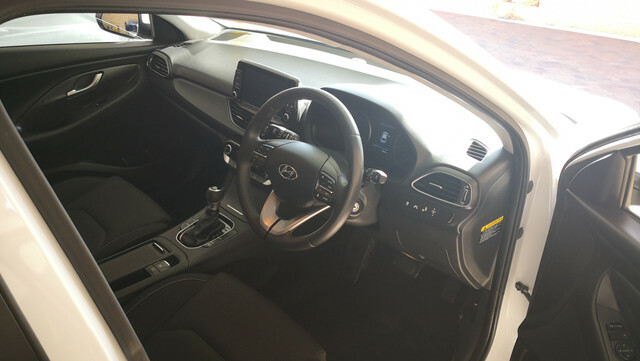 After having a new model Corolla for 13 days in Perth, I wish I'd actually opted for an i30 Go even though I would have missed out on a few features the Corolla had. With being gentle on the turbo, I was referring to the replacement one when fitted. Yeah, the slightly smaller turbo on the i30 V Veloster spools up a bit quicker I believe for slightly better low speed response. I was of course joshing about getting a bigger turbo! 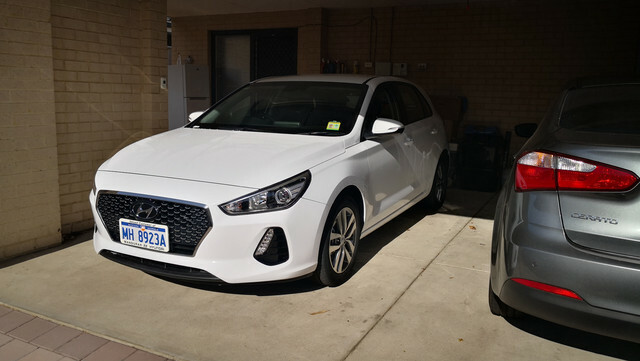 The car I got for the day is a i30 Active, Auto, White. March 18 build with just over 5500 k's on the clock.. I have only just drove it from the dealer to home, which is roughly 10 mins.. Thanks Pete. Well that's positive! The news from today is that the car is not quite ready..
By taking off the exhaust manifold. They broke a couple of studs. So the new turbo, as it is all built into the manifold. Is unable to go back on. They have ordered the new studs & say they will arrive on Monday morning.. So I should be able to collect it on Monday arvo. I may need to leave work early, as it's my 1st day on shift..
On the plus side. They have booked out the loan car till Tuesday for me.. So Iv'e got it for the weekend..
At least they were honest with you.